Have you ever had a 12 year old who has been working on /r/ in sentences and carry-over for years? Have you ever had a 10 year old who says that speech games are “boring”? 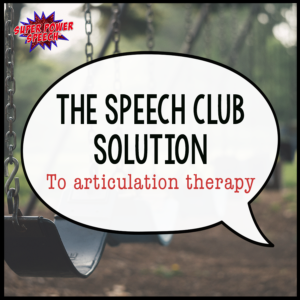 Have you ever been referred a 13 year old for an initial evaluation for articulation? Have you ever been promised by your 11 year old student that they will practice every day only to start over with them every single speech session? These ideas are fun and effective, but they get old and most SLPs don’t have the time to generate new ones every week for their students. 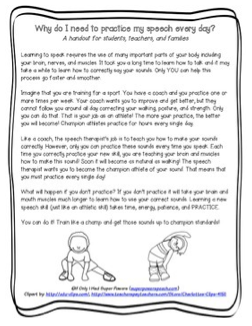 So what is the effective and efficient SLP to do? C.L.U.B.! CHALLENGE YOURSELF to use big words in sentences, word problems, and in environments outside of the speech room. Also challenge yourself to practice every single day! USE OTHER PEOPLE because carry-over happens when you speak to a variety of people. As an additional benefit, adults that know what the child is working on can help that child to be more successful! BUY-IN through bribing (yes, I admit I do it…. ), positive reinforcement, and comprehension as to why it is important to practice every day. I bribe by giving students speech money towards parties. I help buy-in from parents and teachers by giving them a letter at the beginning of the year (included in all Speech Club packets). This year I am ALSO going to foster better comprehension as to why the students need to practice by going through a letter with them explaining the importance of daily practice and analogies to other parts of their lives. You can get this letter FREE by clicking here. 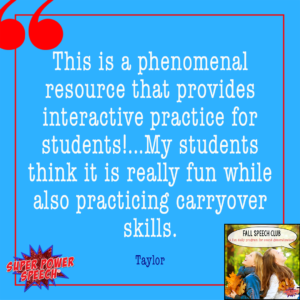 I hope your students really connect with it as well! 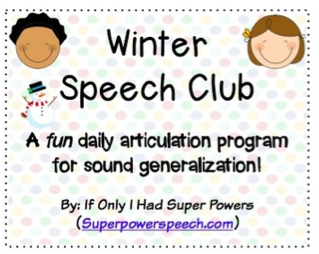 You have GOT to check out my Speech Club! I designed this program to be fun, interesting, and LANGUAGE-INTENSIVE for older students! You can cover both language and speech goals in just a few minutes per day! There are up to FIVE later-developing sounds for students /l, r, s/z, sh, th/ to practice and every day is a new way to practice! And each worksheet requires that the student practice for themselves, another student, their SLP, their teacher, and another adult (parent). 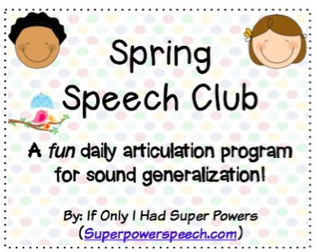 Each sound also comes with a variety of headers to put onto speech folders, a letter to parents, a letter to teachers, and a calendar to check off days attended speech club. You can set up your program to have students attend for 10 minutes every day (this is what I do), or 2-3x per week with additional worksheets to do at home. These are sold by the season and can be purchased individually or in money-saving bundles. Each sound contains SIXTY worksheets per season. If you buy the entire year’s worth, you will have TWO-HUNDRED and FORTY worksheets for each sound! And 1200 worksheets if you buy all the sounds for the year! HOLY CANOLI! And check out the feedback! Click on image of the product(s) that you would like. Purchase and then read the directions. Set up some time for quick and (ideally) daily practice for club members. Then….get ready for some serious articulation practice! I’ll be starting my groups right after school gets started! 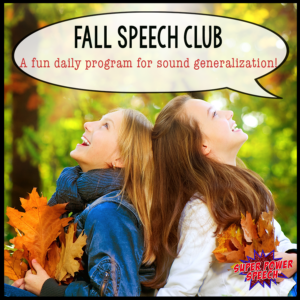 I hope you too will try out a Speech Club program! Let me know how it goes!! Sounds like an excellent, helpful tool for my older kids. 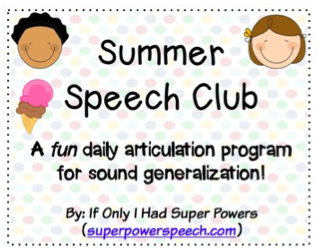 I’m really excited to start using this year with my older students and hope to create me own ‘speech club’ with my K-2 group as well with more of a focus on /k,g/. Thank you so much for creating such a comprehensive product that can be used in multiple ways!! !